near the East Woods on the night of Sept. 16, 1862. This area at Antietam was wooded in 1862. 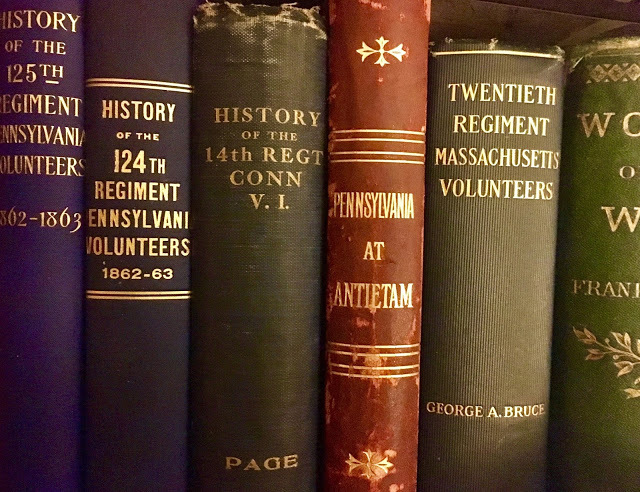 Nearly 36 years after the Battle of Antietam, a Confederate veteran traveled to Bellefonte, Pa., for an event a local newspaper called a "rather romantic errand." William M. Robbins' intentions certainly were noble: The former major in the 4th Alabama planned to return the sword of 5th Pennsylvania Reserves Lieutenant Hardman P. Petrikin* to the soldier's sister. War-time image of WIlliam M. Robbins. 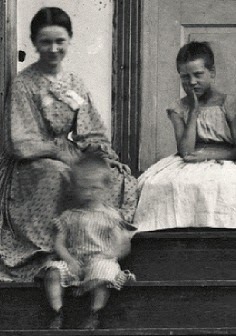 Robbins' connection to the Petrikin family began on the inky-black night of Sept. 16, 1862, eight hours or so before the carnage began in the East Woods and David R. Miller's cornfield. 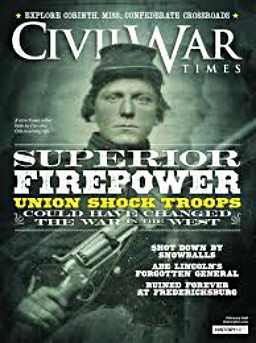 At about 10 p.m., while Robbins and his exhausted troops were resting in an open field about 400 yards northeast of Dunker Church, the major was startled by two or three volleys fired by Confederate troops to his left. "Springing up and inquiring the reason of this," Robbins recalled decades later, "I was informed that they had heard a party of what must be the enemy, who were just in front of us, and had thereupon fired." 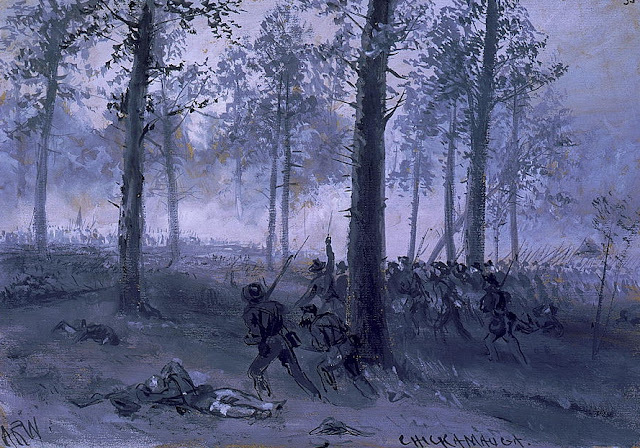 Moments later, Robbins heard a cry in the field from a seriously wounded Union soldier. 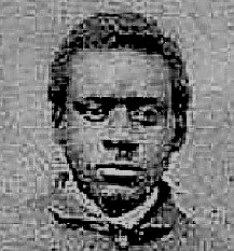 Wary of venturing into the blackness, Robbins yelled that he would provide aid only if any Yankees in the area would hold their fire. After he received that pledge from Petrikin, Robbins and a search party sought the crippled Federal about 20 or 30 yards away. 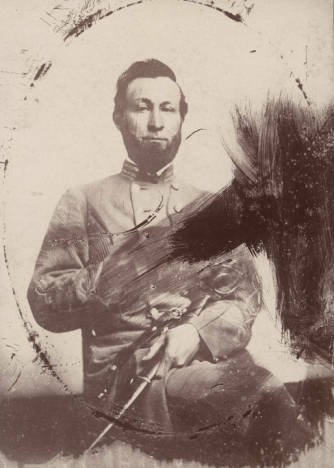 When he arrived at the site with his soldiers, the 4th Alabama officer discovered "two or three" Union dead; a private who died "almost immediately" and Petrikin, who had been shot in the chest. 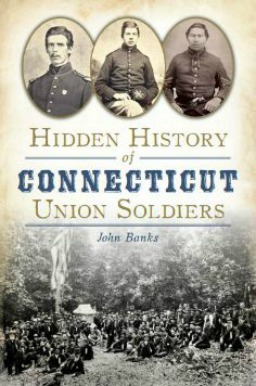 In charge of a reconnoitering squad of 24 soldiers, the Pennsylvania officer told Robbins he had no idea he had stumbled upon a large Confederate force. Petrikin, the 30-year-son of a man who had a "keen sense of the ridiculous," thought his wound was mortal. As Robbins made arrangements to send the Pennsylvania officer to a field hospital, the wounded man pulled out "quite a fine" watch. returned Hardman Petrikin's sword to the soldier's sister. "I make the request of you that if you possibly can you will have my watch sent to my mother," Petrikin said, according to Robbins. 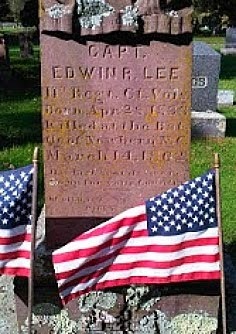 Then, he added, "Tell my comrades of the Union army for me that I died like a soldier should, doing my duty." In the confusion that night, someone apparently snatched Petrikin's sword, undoubtedly a prized trophy for a Confederate soldier. 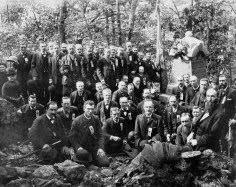 During a truce on Sept. 18, the day after Antietam, Yankees met Rebels near the Dunker Church and Smoketown Road. Walking up the lane "about half its length," Robbins visited with a friendly Union officer no older than 27 and of medium build. Years later, Robbins couldn't recall the soldier's name, but the Alabaman clearly remembered handing over Petrikin's watch to him and telling the Yankee of Hardman's dying words. Position of 4th Alabama the night of Sept. 16, 1862. This view is looking east from Smoketown Road. Decades after the war, Petrikin wondered about the whereabouts of Hardman Petrikin's watch. So at the urging of a Northern vet, he wrote a short story for The National Tribune, a newspaper for Civil War veterans, inquiring about it. Shortly after publication of his story in the summer of 1891, he was contacted by Petrikin's sister. 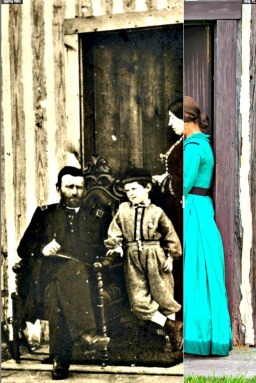 Mother had received the timepiece, Marion Petrikin wrote the Confederate veteran, but the family would relish the return of her brother's sword. Could he help find it? readily agreed to ship the weapon back to Pennsylania in 1898. Motivated, Robbins began his search for the sword, but the dominoes didn't begin to fall until seven years later. 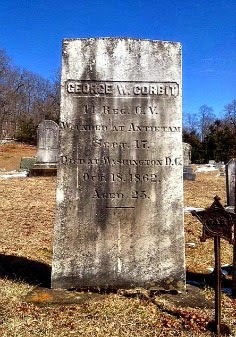 In Gettysburg in 1898, Robbins had a serendipitous visit with a 4th Alabama veteran. 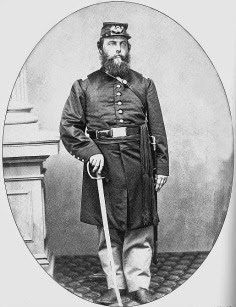 He recalled helping carry the grievously wounded Petrikin to an aid station and later giving the sword to his captain, Major D. Sterrett of Company C. After he was contacted by Robbins, Sterrett -- who lived in tiny Beckville, Texas -- readily agreed to ship the weapon by express to Gettysburg. 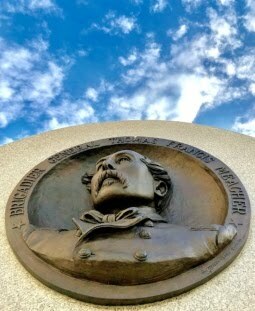 A member of the Gettysburg Battlefield Commission, Robbins contacted Pennsylvania Governor Daniel Hastings, telling the Bellefonte-area man of his desire to personally re-unite the sword with the Petrikin family. 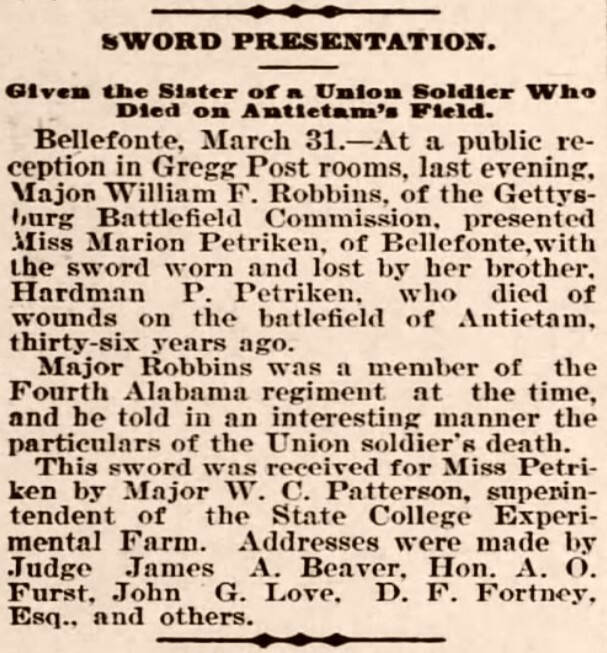 "Being informed that his sister still lived in Bellefonte," the local newspaper reported, "[Robbins] determined to come here in person and with his own lips deliver the last message of the dead and tell the sad story, then deliver to Miss Petrikin the sword so gallantly won by her brother ..."
Gleeful about the discovery of the sword, Bellefonte citizens turned Robbins' three-day visit there in spring 1898 into "one round of entertainment." The veteran was a house guest of a local bank teller, and a dinner party was held in his honor. "Major Robbins was the center of attraction everywhere," a newspaper noted, "and his courteous, genial manner made him more popular than he had become even before his arrival." 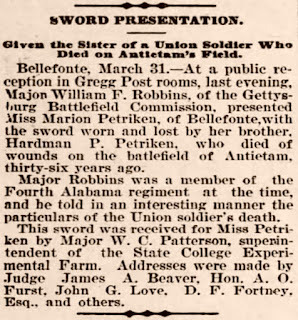 On March 30, 1898, the sword was formally presented to Marion Petrikin at the local Grand Army of the Republic post. The 69-year-old veteran shared a bond far stronger than the sword with Marion -- he had lost four brothers during the Civil War, including one at Antietam. 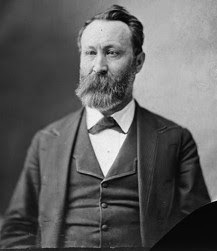 Among the dignitaries that night were former Pennsylvania Governor James A. Beaver, who had lost his leg at the Battle of Reams Station in Virginia in 1864, and Major William C. Patterson, perhaps the last Union soldier to speak with Hardman before he was wounded near the East Woods. After a speech in which he recounted Hardman Petrikin's fate, Robbins presented the sword to Marion. Newspaper accounts made no mention of the unmarried woman's reaction, but the last surviving member of the Petrikin family in the county surely must have been touched. Before the grand evening concluded, resolutions were passed in appreciation of Sterrett and Robbins for the return of the sword. Then the crowd broke into patriotic songs and slowly walked into the chilly Pennsylvania night. The men and women of Bellefonte were "full of kindly and fraternal feeling," a newspaper reported, "realizing that after all the American people are one in heart." -- Altoona (Pa.) Tribune, March 30, 1898. -- Carolina Mascot, Statesville, N.C., April 14, 1898. -- Harrisburg (Pa.) Telegraph, April 1, 1898. -- Lewisburg (Pa.) Chronicle, April 2, 1898. -- Linn, John Blair, The History of Centre and Clinton Counties Pennsylvania, Philadelphia, Press of J.B. Lippincott, 1883. -- Official Records of the Union and Confederate Armies, Series I, Vol. LI, Washington, Government Printing Office, 1897. -- The National Tribune, July 16, 1891. * Spelling of his last name also Petriken. 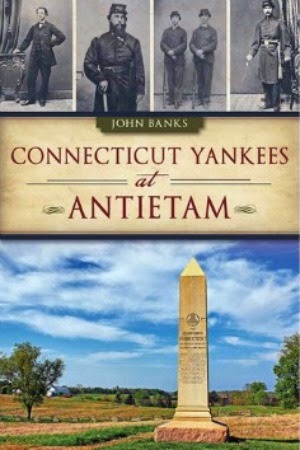 Hi John, thanks for another great story from Antietam! I did a little digging, and believe the unfortunate Private who was killed on that detail was Robert Milo Askey, also of Company E. From Centre County, PA, he had enlisted the previous June at about age 20. He was the only man other then the Lieutenant in Company E or I killed that evening. Yah, I believe that is so, Brian. Thanks for the kind words. I could not believe an image of the Alabama captain who kept the sword for so long after the war turned up. I had fun writing this one. Lots of rich detail available in contemporary newspaper accounts. Great article! I really enjoy reading the stories you research and publish here! Keep up the excellent work! Terrific story John, It would be awesome if the sword is still in the Petrikin family. 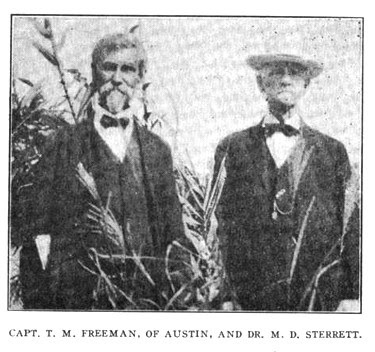 I believe we have a photo of Captain Freeman's final resting place in the Texas State Cemetery here in Austin. Great story. Appreciate your posts. Andrew and Tad. Thank you for another great story. I enjoyed it very much. "a man who had a 'keen sense of the ridicules'"
I’m also curious as to the where abouts of the sword today. Still with the family? In a museum? It would be something to see. Hi, Jason: Don't know where sword is today. Perhaps still with family. Quite an heirloom. Perhaps 15-20 years ago I approached the female in charge of "interpretation" at the Antietam National Battlefield and asked if my brother and I could reenact Petrikin entrusting his sword to Robbins during their anniversary commemorations. I was told that this verified human interest story didn't fit with the "chaos" inside Dunker Church the park was trying to "interpret" and refused to allow me to reenact the event.